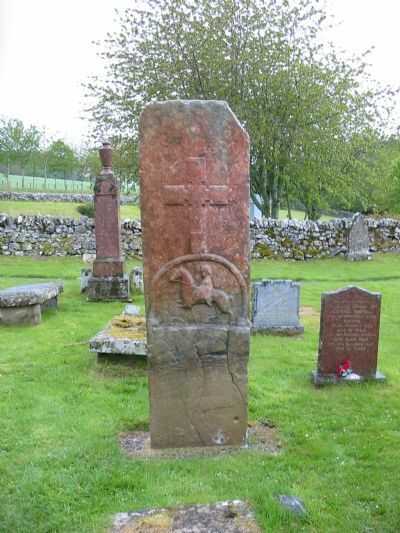 Within the graveyard stands the Edderton Pictish Cross Slab dating to the 9th century AD. It is made of sandstone, stands six feet three inches high, and is carved in high relief on both sides. The high reputation of the Edderton slab is based on its east face, as it is believed to be emblematic of early sculpture in Scotland. On the east face is carved an unarmed horseman. He rides purposefully forward under a fine arch that supports a Roman cross. Below him are two armed horsemen, again beautifully carved, but this time incised into the stone. All three riders are depicted as moving from right to left. On the west face there is carved a large Celtic cross positioned on top of a stepped base. This stepped base, symbolising the hill of Calvary and usually with only three steps, is common in late medieval graveslabs, but is much rarer in early period slabs of this kind.